This new series is for total beginners or “almost beginners”. First the students learn the verb "to have" and practice it with the recording below. Then you give them some appropriate vocabulary like "a friend", "a pencil", "an idea", "a bicycle", "a pet" or whatever is appropriate in their culture and have them practice with these words saying "I have a friend", "He has an idea", "They have a bicycle", "You have a pet" etc. They go on to try the same thing in other groups using all the pronouns. It is best to give this vocabulary in the students’ native tongue to avoid any misunderstandings. Have them learn numbers 6-10. As they did in the previous lesson they work in groups and tell each other which number they and the others are. Finally, they associate a number with a first name and an object, person, abstraction, etc. For example they will say, "Number six is Anja and she has a pet" or Number ten is Pierre and he has an idea". They switch groups several times until everyone knows what everyone else has. 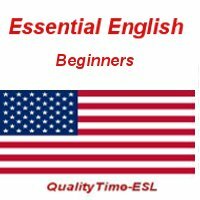 en Free ESL Podcasts Essential English-For Beginners ?